Kingfishers are notoriously skittish and hard to approach. 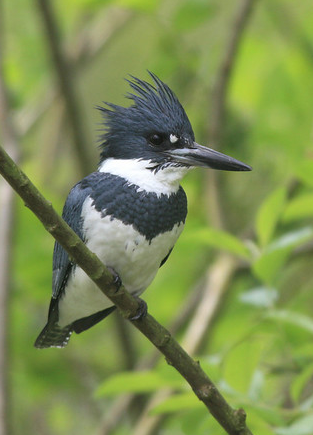 This the photo of a male belted kingfisher was taken from just 25 feet away (Rocky Rockwell). Thanks to (Winston “Rocky” Rockwell @ www.northwestnaturalimagery.com) for the use of his beautiful kingfisher photo. A hatchling common loon hitching a ride on its mother’s back. Thanks to Roy Toft ( Toft Photo Safaris & Gallery) @ www.ToftPhoto.com for the use of his unique loon photo. Mike Farrell (mikefarrell.efoliomn.com) and Aaron Wade also contributed photos for this program. All other photos by Old Naturalist. 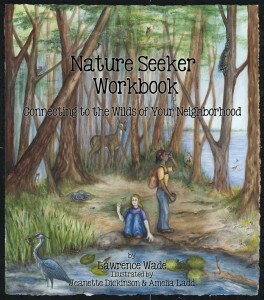 Download the Spring Birds Activity. Answer the questions using the text below. Click here for the PDF. 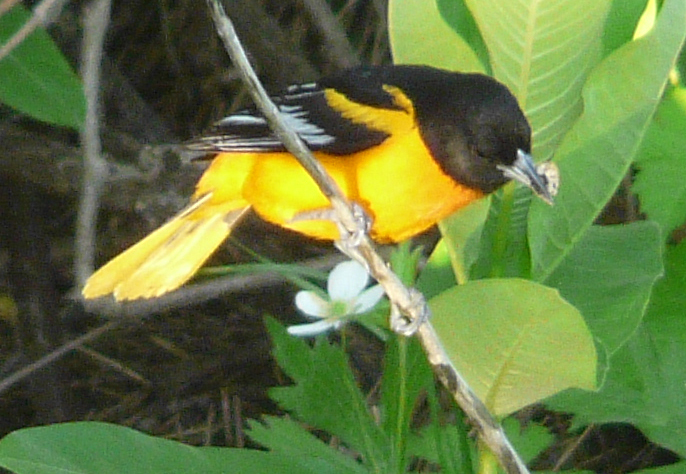 Orioles are a favorite spring bird. Orioles begin arriving to the upper Midwest. In fact, May first is sometimes called “Oriole Day” by birdwatchers. 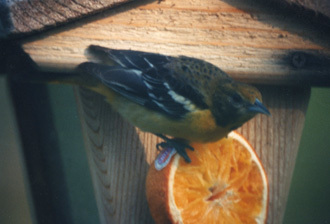 Orioles feed on fruit and will readily come to a feeder with grape jelly, red sugar water or an orange. Shortly after arriving the oriole pair will begin nest building. The nest is a beautiful hanging basket that is suspended high in a tree. The female may take up to a week to complete the nest. She first strips off the outer fibers from an old milkweed plant. Then she carefully weaves the nest with her beak. The nest may contain 4-6 eggs. Orioles leave upper Midwest in September and spend the winter in Central America and northern South America. Goldfinches are small birds with a thick seed-eating beak. They spend the entire year in the upper Midwest, but change to a drab greenish-brown in winter. Goldfinch are found in small flocks throughout the year, except during the mating season when they form mated pairs. 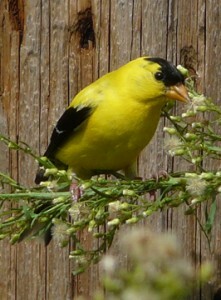 Goldfinch eat sunflower and thistle seed at feeders, using their beak to crack open the seed. During the spring they can be often seen eating dandelion seeds on lawns. 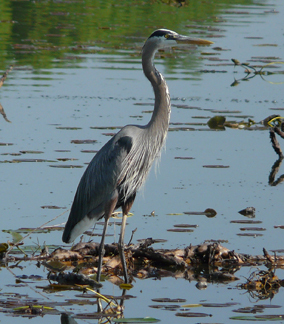 The great blue heron is one of the tallest birds in the upper Midwest, getting up to 50 inches high. They are often confused with cranes. They are water birds and are most often seen standing in shallow lakes looking for fish and frogs for food. Herons have long stick-like legs that allow them to walk in the water without being seen by potential prey. The spear-like beak allows the great blue heron to quickly kill unsuspecting prey. Herons wait patiently in the water for fish to gather close to their body and then strike with lightning speed. When prey in the water is not available, great blue herons have been seen in the fields, standing along mouse runways and spearing field mice. I once observed a “g.b.h.” eat over a dozen mice in an hour. Great blues return to upper Midwest when the lakes thaw out, usually around the beginning of April. They nest in colonies in tall trees and usually raise 3-5 young. Great blue herons spend the winter in the Gulf of Mexico and Texas. 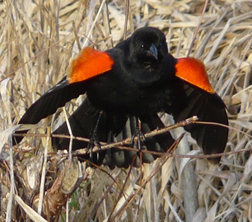 Male red-wing blackbird displaying at its cattail territory. The red-wing blackbird lives in the marshes of the upper Midwest. Its “okalee” song is often called the “voice of the marsh”. 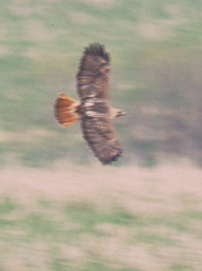 March to June, male red-wings set up territories which they readily defend from other male red wings. A male will dive at another bird with its red wing patches out, in hopes of scaring it out of his area. The female will make a nest out of grasses that is woven around clumps of cattails. They raise 3-5 young. In August, the red-wings leave their territories and molt their feathers, in preparation for the fall migration. Red-wings spend the winter in Central America. The arrival of robins is a welcome sign of spring. They usually return in mid March. The males have a beautiful fluted call that can be heard through the spring. After a rain the robin’s song has been called the “rain song”. Robins are ground feeders and often seen eating worms and other creatures that live beneath the ground. Robins also eat fruit. Some Robins spend the winter in upper Midwest feeding on crab apples. Their nest is built out of mud and grass and they lay 3-4 bluish colored eggs. 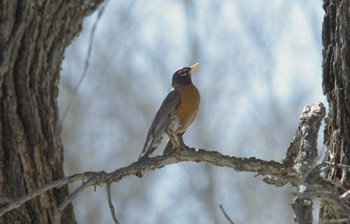 In the fall, Robins migrate south to Louisiana and Florida to spend the winter. 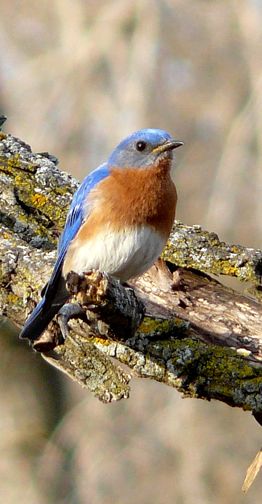 The eastern bluebird is in the thrush family and closely related to robins. Bluebirds make a beautiful, liquid whistle, “tur-a-wee” that can be heard when they arrive in mid March. Bluebirds return to the same area that they nested in the previous year. Bluebirds are slightly smaller than a robin, and prefer short grassy areas mixed with hardwoods. The grassy areas are where they feed (primarily on insects), and the hardwoods are where they might nest. Bluebirds are cavity nesters (nest in tree holes) and they must rely on woodpeckers to make the holes for them. Bluebird populations declined in the early 1900’s due to the introduction of the more aggressive European starling and house sparrow. However, in the past 30 years, bluebird populations have increased due to the building of bluebird nest boxes. Many cities and parks have set up bluebird trails with nest boxes (7/acre) that are monitored by volunteers. Bluebirds migrate to southern states for the winter. Seeing a “V” of migrating Canada geese in the sky (early March) is a sure sign of spring. At that time, mated pairs of geese set up their breeding territories. The male and female mate for life. A male can be identified from a female because its neck is thicker than the female. A favorite nesting area for geese is on top of a muskrat lodge. 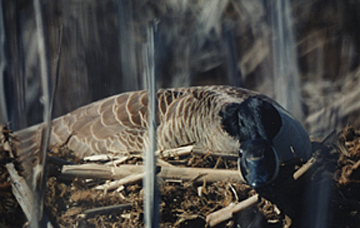 Female nesting on muskrat hut. 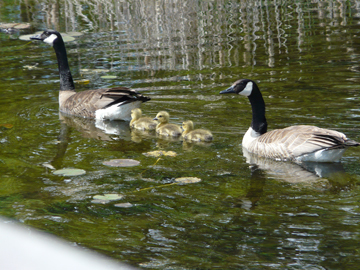 The goslings are born about the first of May and grow throughout the summer. In August, the goslings are full grown. During the month of August, most geese are flightless because they molt their feathers in preparation for the journey south. The geese do not leave until the lakes and ponds have frozen over (usually in November or December). They have a short migration to southern Missouri and southern Illinois. Currently, the goose population in the upper Midwest is too high. In 1955, geese were re-introduced into the Twin Cities in Minnesota. They had been over-hunted by early settlers and extirpated (completely eliminated) from the area in the 1800’s. The red-tailed hawk can often be seen soaring above freeways and open areas looking for mice, groundhogs, and other small rodents. Only the adults have a beautiful red tail. Red-tails mate for life and remain in the same territory for years. Before nesting in the spring, the pair can be seen soaring and diving together in the sky. They may re-use their old nests from year to year. The nest is made of sticks and is three feet across and three feet high. 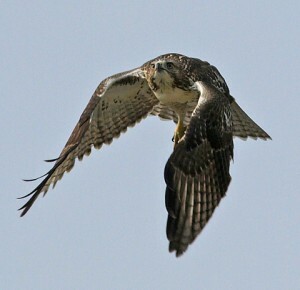 Red-tails will raise one to five young. Some red-tails remain in the upper Midwest throughout the year, while others migrate south. Mourning dove on a wire. The mourning dove can often been seen in the spring on telephone wires. Mourning doves can be identified by their long tail, small head, and gray color. The mourning dove gets its name from its mournful “cooing” call (sounds like an owl) that can be heard in April and May. They lay 2 eggs in a loosely made nest of sticks and twigs. Mourning dove pairs mate for life. They are ground feeding birds with most of their diet coming from seeds, but are easily attracted to feeders by placing millet and cracked corn on the ground. Mourning doves migrate south in the winter to northern Florida, Louisiana and Georgia. They are often found in groups of 20-50 birds. 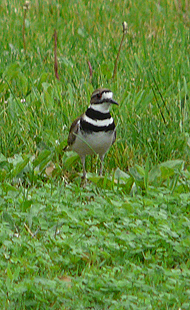 Killdeer are robin-sized birds that are often seen in grassy wet areas. They are told from a robin by the double necklace and white breast. Killdeer get their name from their call, “killdeer-killdeer”. The call can often be heard as the bird flies in circles overhead. They nest on the ground or on flat roof tops of buildings. The roofs of schools are often sites for killdeer nests. If an intruder approaches a nest, one of the adults will try to get them away from the nest by pretending to have a broken wing. There is usually 3-5 young in a clutch. The chicks are “precocial”, meaning they can gather food and run as soon as they hatch out of the egg. The killdeer migrates as far as South America in the winter, and return to upper Midwest in late March. In the spring, the common flicker can be heard in trees making its “woika-woika-woika” call. They are jay-sized woodpeckers and have beautiful golden under wings that can be seen as they fly. The golden feathers of the flicker were so greatly valued by Native Americans, that some of the native clans were named “Flickers”. Flickers nest in holes of dead trees 10-30 feet above the ground. 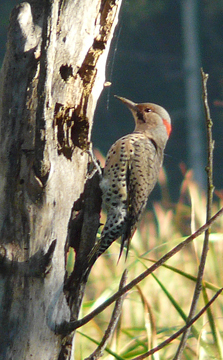 Flickers differ from most woodpeckers in that they feed on ants in the ground and not in trees. For this reason they are often seen on the ground. In fact, the stomach of a dead flicker had over 2000 ants in it. There have been reports of flickers dying from ants contaminated with insecticide. Flickers migrate south for the winter and return to upper Midwest in early April. 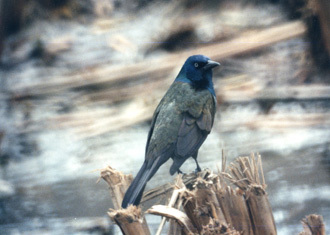 Common grackles are one of the largest members of the blackbird family. In flight, a grackle appears all black with a long tail. However, when seen in the sunlight, it has an iridescent blue head. Many people do not like grackles because they are aggressive birds at the feeder. 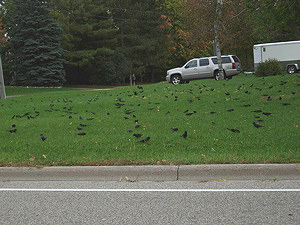 However, grackles eat many harmful larvae that hatch in trees and on the ground. Grackles often nest in pine trees. The nest is made of mud and grass and is very similar to a robin’s nest, but slightly larger. They lay five eggs. Grackles migrate in large groups in the fall and then return to upper Midwest by mid-March. Indigo bunting feeding on pollinating insects. Indigo buntings are small finch-like birds that are an iridescent blue. The best time to see indigo buntings is in early May when the male is calling from the trees, “See-see-hear-hear-peter-peter”. Indigo buntings set up their territories and nest about a month later than other migratory song birds. 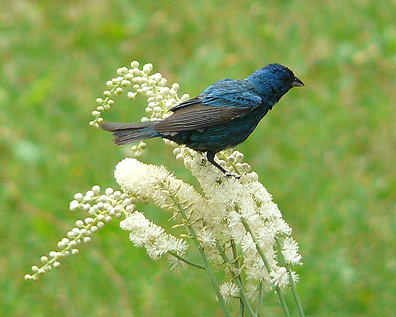 Indigo buntings are seed-eaters and can also be seen eating dandelions and other seeds from garden flowers. However, they are not usually seen at bird feeders. Indigo bunting calling in the woods. 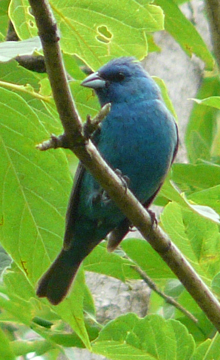 Indigo buntings are migratory and travel as far south as Central and South America. They return to upper Midwest in early May. The rose-breasted grosbeak is the size of a robin. The male has a black back and wings and a bright rose-colored breast patch. The Grosbeak gets its name from its thick white beak, which it uses for cracking seeds. The best time to see grosbeaks is during the month of May when the males are calling from the tree tops for a mate. They have a beautiful melodic call that sounds like a “hurried up” robin call. 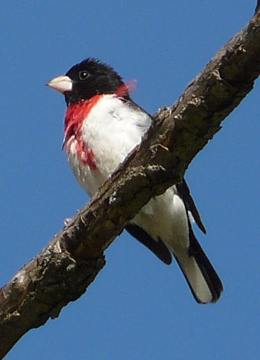 Grosbeaks are usually found in forested areas. They readily come to bird feeders that are stocked with sunflower seeds. Grosbeaks build a loosely woven nest made entirely of twigs. The nest is usually found only about 10 feet above the ground in a shrub or tree with dense foliage. Both male and female grosbeaks incubate the eggs (3-6 per clutch). Common loon with chick hitching a ride. 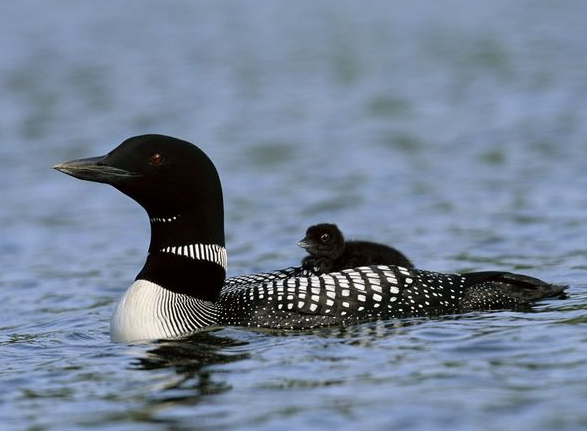 The common loon is the Minnesota state bird. Anyone who has spent time on a midwestern lake has heard the mysterious wailing calls of the loon that is known as the “loon’s laughter”. Loons are larger than a mallard duck and have heavy bodies, up to 12 pounds. Most birds have hollow bones which allows them to fly. However, the bones of a loon are solid, allowing them to dive to great depths (up to 200 feet). Since they are heavy-bodied birds, “taking off” from the water can be a problem. So loons need to live on a lake with a “flight runway” of at least 100-600 feet. Loons are awkward on land, but in the water, their streamlined body and heavily webbed feet, allows them to feed underwater for up to five minutes. Loons eat many types of fish that can be up to 10 inches in size. The red eyes of the loon allows them to see in the darker underwater world. Loons build a nest out of reeds along the edge of lakes and the nest rests just above the water line. Loons will not nest on lakes where there are motor boats because boat waves may flood their nests. Two eggs are laid and they are incubated by both the male and female. The family leaves the nest within a few days of the chick’s hatching. The loon family returns to shore occasionally to warm up the young birds. From the time they are hatched, chicks are fed whole fish by the adults. There are very few predators on adult loons, but chicks are preyed upon by northern pike, muskie, snapping turtles and raccoons. 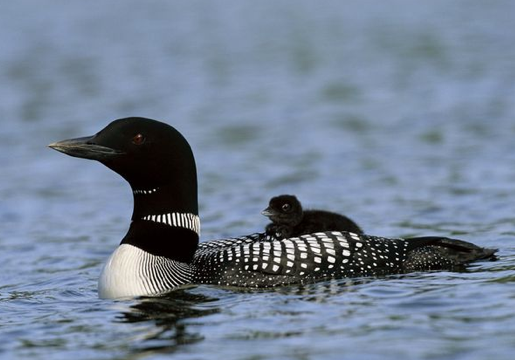 A young loon will ride on its parent’s back to keep it warm in a cold Minnesota lake. If you have ever walked or boated up a river, you have probably encountered a kingfisher. As you journey up the river, you are going to hear the kingfisher’s “rattle call”. The kingfisher is letting you know that it is the “boss” of the river and you are in its territory (which can be over a 1000 yards long). A kingfisher will defend its territory by attacking other kingfishers. When feeding, a kingfisher perches on a branch along a stream or hovers above the water. When a fish becomes visible, the kingfisher dives headfirst into the water. After catching the fish, the kingfisher will bring it back to its perch and pound the fish against the branch of a tree. Their primary food are small fish. Kingfishers nest in the ground on steep banks. The hole opening is three inches and they dig out a nest 3-6 feet into the ground, using only their beaks. 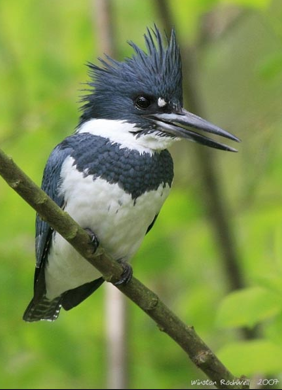 In winter, kingfishers migrate south to areas of open water and plenty of food. Male Ruby-throated Hummingbird feeding on Penstemon flowers. Male ruby-throated hummingbirds have beautiful red throat feathers which are iridescent and shine brightly in the sun. Hummingbirds are less than 4 inches in size and weigh only a tenth of an ounce. In addition, they can fly both forward and backward, while their wings beat over 50 times in a second. Hummingbirds are nectar feeders and especially love red flowers that are tube-shaped. They are ravenous, eating almost ½ of their body weight each day. The nest of a hummingbird is less than two inches in size. It is made of spider silk, lichen camouflages the outside of the nest and the inside is lined with dandelion or thistle down. The two eggs are no larger than the size of a pea. The nest will actually stretch when the young birds start to outgrow it. 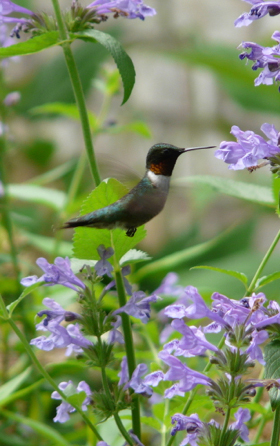 Hummingbirds migrate south and spend the winter in southern Mexico and Central America. Awesome list of spring birds! Thank you!